Novia produces a full line of vibration isolation hangers ranging from neoprene to high deflection spring and neoprene models. 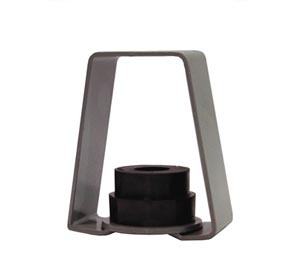 Isolation hangers are used to support suspended rotating and reciprocating equipment in order to prevent unwanted vibration from entering occupied areas of the structure. Isolation hangers are also used to support duct near air handling equipment and pipe in mechanical equipment rooms to prevent vibration transmission through the buildings distributed systems. From a small unit heater to a several thousand pound suspended air-handling unit to an entire acoustical ceiling grid, Novia has the right hanger for the application. Double Deflection Neoprene element contained within a steel hanger box. Capable of supporting three times the rated load without failure. Rated capacity ranges from 59 lbs. to 2,450 lbs. This spring element is contained within a steel hanger box, and is extremely powerful – capable of supporting three times the rated load without failure. Rated capacity ranges from 29 lbs. to 6,900 lbs. Capable of 30-degree misalignment between the rod attachment to structure and the connection to the supported equipment. Spring & Double Deflection Neoprene element contained within a steel hanger box. Neoprene hangers used with wire supports. Typically used for isolated suspended ceilings. Rated capacity – 65 lbs. to 200 lbs. Used to prevent movement caused by thermal expansion or contraction on isolated riser systems. Rated capacity – 500 lbs. to 50,000 lbs. Used in pairs. Available with or without bolting plate. Used to prevent horizontal movement in riser systems, which are isolated for vibration or thermal expansion purposes. Can be preset for maximum upward movement, maximum downward movement, or for both upward and downward movement simultaneously. Rated capacity – 500 lbs. to 3,500 lbs. When fan thrust exceeds 10% of the fan weight, we recommend thrust restraints to prevent over extension of flex connector between the duct and the fan. Can also be used in compression to prevent movement of duct toward fan on the return end. Rated capacity – 29 lbs. to 908 lbs.